See the famous Reclining Buddha in the flesh when you visit the Suwankuha temple, but watch out for the monkeys, they are notorious for stealing things from travelers! Snap photos at James Bond Island and recreate scenes from the famous 007 movie! Nice trip to James Bond Island. Our guide told us good background informationen on thai culture in this area. 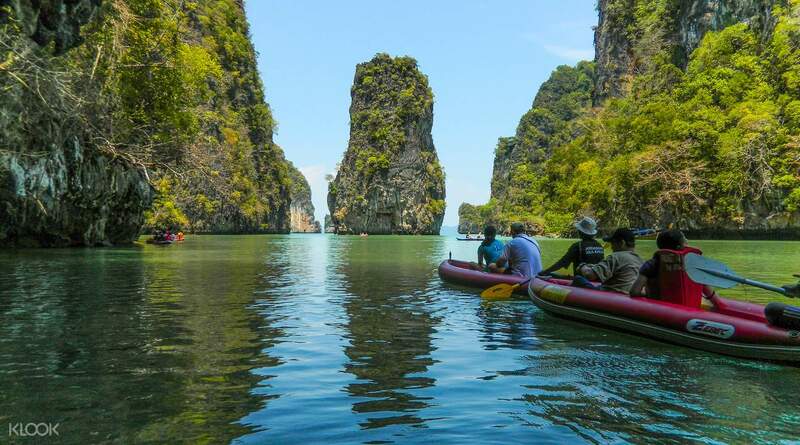 Live out your inner 007 with this tour that takes you straight to the iconic James Bond Island from the movie, 'The Man with the Golden Gun', and get to explore the rest of the beautiful Phang Nga Bay while you're at it! At 10:00am, your pick up will fetch you from the hotel and take you straight to the pier for the tour. Before exploring the bay however, you will be taken to Suwankuha Temple, home to the famous reclining Buddha. Here you'll have a chance to spot some local monkeys, but be careful since these crazy critters are known for taking your cameras, bags, food—anything and everything they can get their hands on!—so be mindful of your belongings. 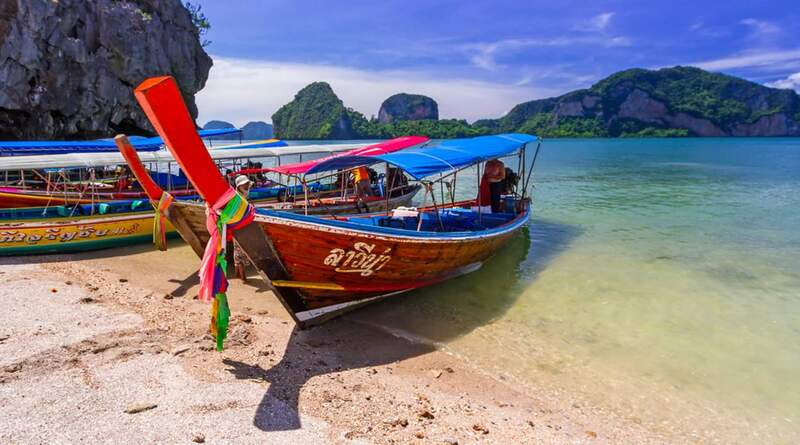 After exploring the temple, you'll get on a traditional Thai long boat to explore the rest of the Phang Nga Bay National Park, and then to Panyee village, the floating Muslim village for lunch. Discover the beautiful history and culture of the village as you hop from shack to shack, meeting some of the locals. 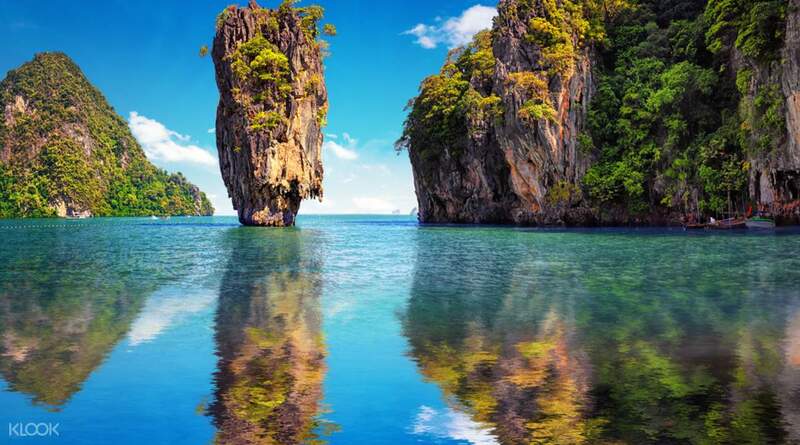 After lunch, travel to the famous James Bond Island, locally known as Khao Ping Kan. Feel free to recreate your favorite James Bond scenes or jump in the water for a swim! 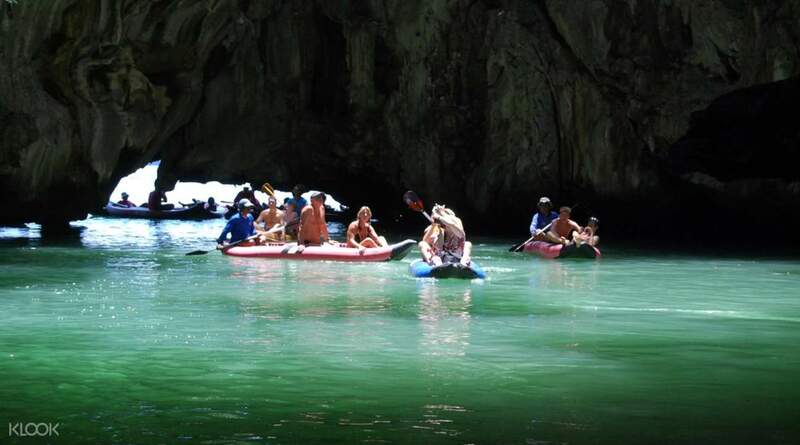 If you decided to go with Package B, you'll even get to kayak to some of the sea caves at Talu Island—a great way to cap off the day. Make like 007 and kayak to the iconic James Bond Island, where you can swim, take photos and recreate some of the scenes from the movie! I can not recommend this trip enough. After spending hours scanning various firms Klook came out top. The driver arrived on time, our guide ‘Happy’ was very friendly and helpful and the trip was outstanding. The only way this trip could be marked down is the behaviour of the customer and that is something the provider can not be held responsible for. Well done Klook a 5star package which I throughly enjoyed. I can not recommend this trip enough. After spending hours scanning various firms Klook came out top. The driver arrived on time, our guide ‘Happy’ was very friendly and helpful and the trip was outstanding. The only way this trip could be marked down is the behaviour of the customer and that is something the provider can not be held responsible for. Well done Klook a 5star package which I throughly enjoyed. The tour was well organized with a nice profesional guide Kim. Usually I don’t like such touristic activities, but there were no other ways to see and enjoy the nature of Phang Nga. Recommend as 1 day sightseeing. The tour was well organized with a nice profesional guide Kim. Usually I don’t like such touristic activities, but there were no other ways to see and enjoy the nature of Phang Nga. Recommend as 1 day sightseeing. great experience, pickup driver is not too late despite the heavy jam. Long boat ride is quite long but the guide is very entertaining. We had some time to roam around James bond island, which is very crowded and very hot. The lunch was delicious and seafood were fresh. great experience, pickup driver is not too late despite the heavy jam. Long boat ride is quite long but the guide is very entertaining. We had some time to roam around James bond island, which is very crowded and very hot. The lunch was delicious and seafood were fresh. A Very Good Guide and arrangment , without bringing you to any where for *earning commisson base shopping*. Trip planning as per schedule and on time. A Very Good Guide and arrangment , without bringing you to any where for *earning commisson base shopping*. Trip planning as per schedule and on time. Good service. Clean ferry. Must take if you want to enjoy views on route. Very nice transfer service. We enjoyed at the deck. Go for it!! Good service. Clean ferry. Must take if you want to enjoy views on route. Very nice transfer service. We enjoyed at the deck. Go for it! !